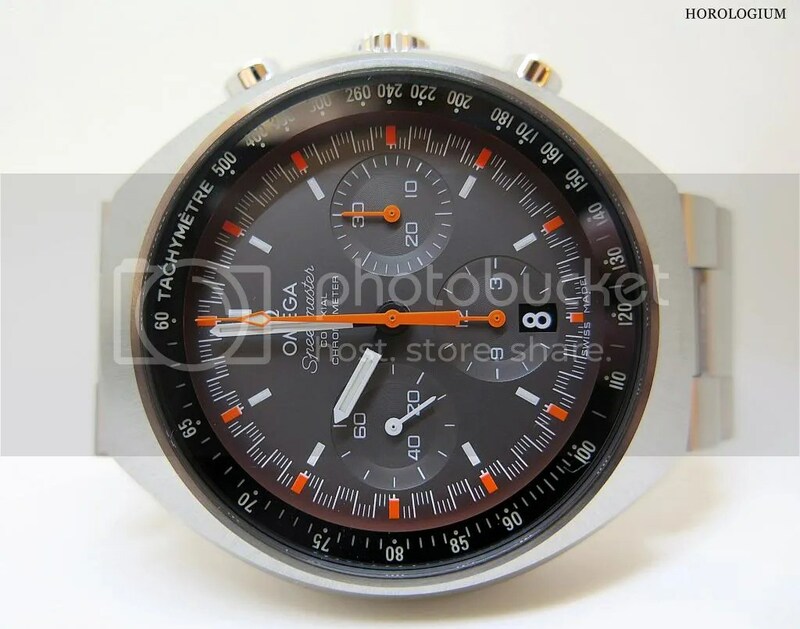 Earlier this year I blogged about the Omega Speedmaster Mark II re-issue. Today, Horologium brings you live photos of the two versions, with thanks to Omega Australia and the Castlereagh St boutique in Sydney. 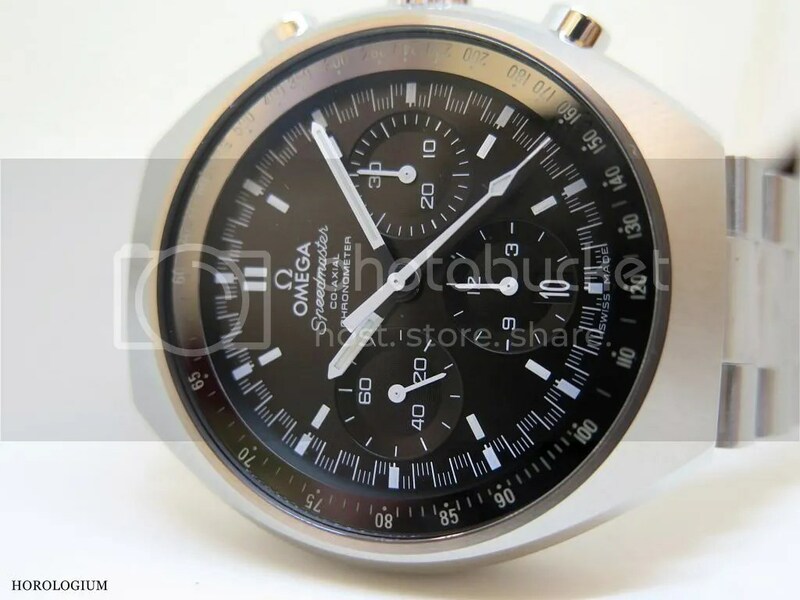 To reiterate Omega, which not only has a rich archive into which it can delve for inspiration but also a longstanding loyal fan base for many of its historically important models, decided to release a modern version of their 1969 Speedmaster Mark II, a perennial favourite amongst Speedy collectors for both its distinctive case and dial, and because of its manually wound Calibre 861 movement. For Speedmaster enthusiasts, as is the case with Rolex collectors of certain models, nothing is unimportant, and any modernisation of a beloved watch will be scrutinised within an inch of its font. So it has been with this one. As mentioned in the previous post, a major point of difference in the modern version is that it contains the automatic Co-axial Calibre 3330 with a column wheel chronograph, as opposed to being a manual. Dedicated Speedy fans appear to be pleased with this, as it reminiscent of the Cal.321. Other changes are the additions of a date window at 6 o’clock, with its adjustment corrector at 10 o’clock, a printed (on the crystal) tachymetre scale that is illuminated by Super-LumiNova, and hour and minute marker, centre hand and hour and minute hands similarly lumed. For the Speedy fans/ collectors who love the original Mark IIs, these are both quite traditionally styled. 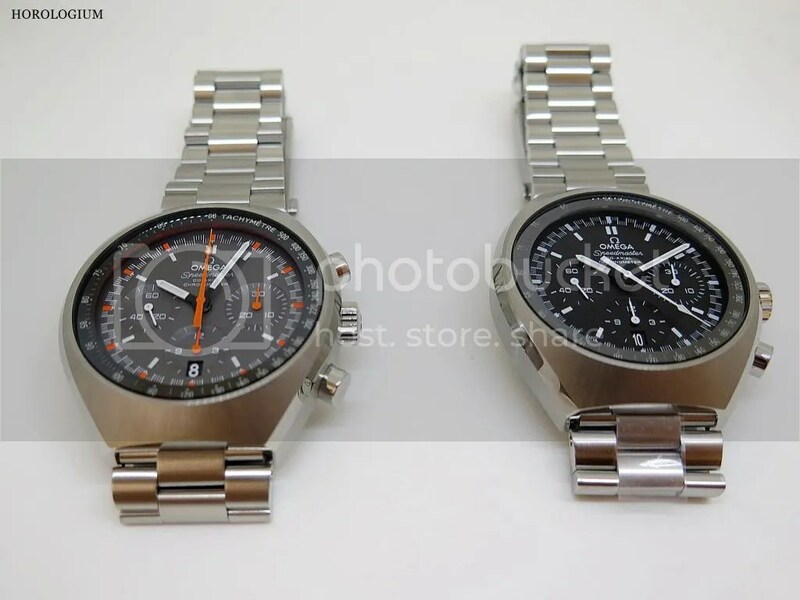 The low key black version has a black track on inner side of the crystal with a transparent tachymeter scale, and the other model is similar to the original’s ‘racing style’ with orange/ grey. The lume to the tachymeter bezel is subtly done and adds functionality, but not at the expense of the original design. There are those (and I have expressed this view on Horologium) who ponder about the predilection of putting in date windows for modern re-issues of classic watches. I find myself asking “why?” a lot, feeling as though there has been something lost, from a purely visual point of view, by this addition, but as myself and my Speedmaster collector friend agreed after visiting the boutique to look at these new Mark IIs, we were pleasantly surprised. It works. My collector friend has an even more firm view about date windows in modern re-issues than I have, but we agreed that in this case, it doesn’t affect the symmetry of the dial and, most importantly, is unobtrusive. Another difference is the text. 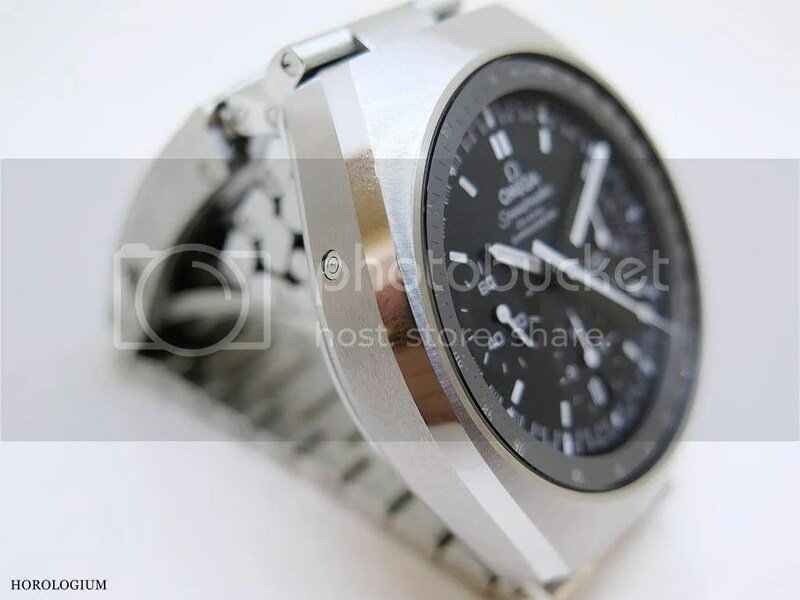 On the originals, it says “Omega Speedmaster Professional Mark II”, whilst for the new versions, the new movement takes pride of place instead. Apart from a centre minute hand, there is a small seconds at 9 o’clock, the aforementioned new date window at 6 o’clock, a 30-minute recorder at 3 o’clock and a 12 hour recorder at 6 o’clock. 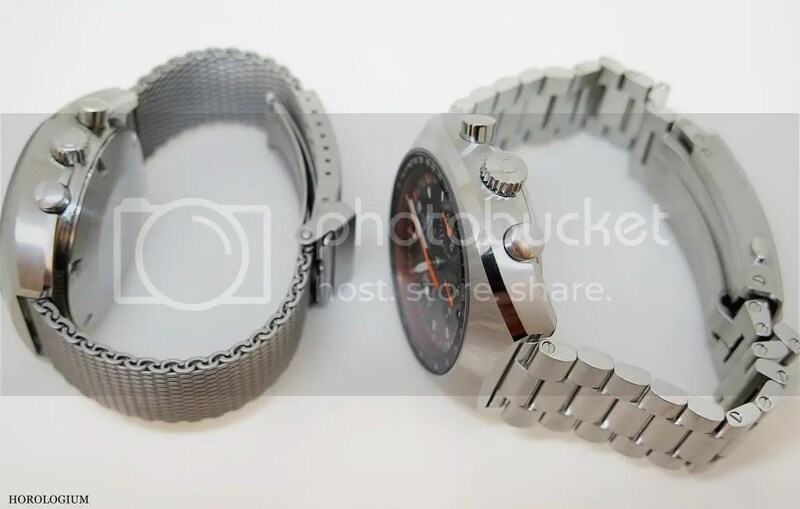 The predominantly brushed stainless steel case can seem more sleek than the original when viewed from the front, partly due to the combination of brushed and polished metal, but the 2014 version is in fact, larger. 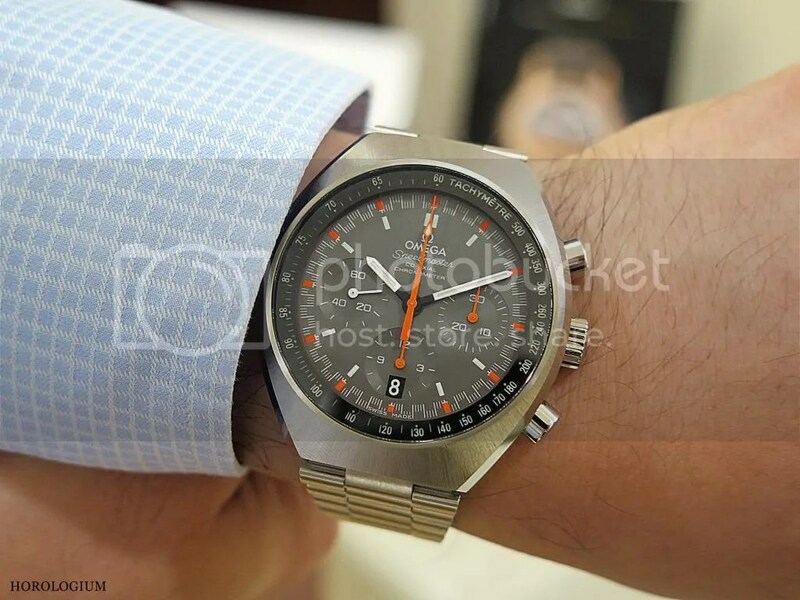 It appears that one of the abiding concerns with the original for some is that it sits too largely on the wrist. Despite this new version being bigger, a very different bracelet means that it does not sit all that differently in ‘wrist comfort’ terms to the original, and in fact is pretty comfortable for a hefty watch. The new Mark II measures 42.40 x 46.20mm with a thickness of 14.85 mm. The original Mark II measures 41.75 x 45mm and is 14.55mm thick. 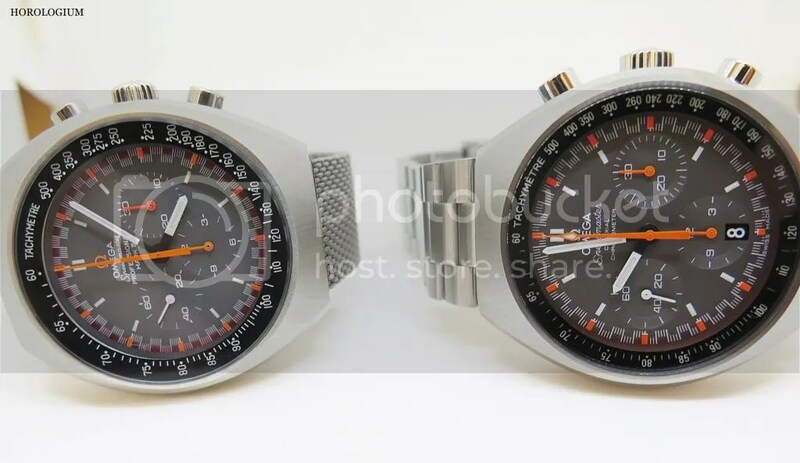 These are very nice modern versions, and for owners of the originals, the additional of one of these to a Speedmaster collection would, to me, work very well. There have been many Speedy iterations over the decades, many commemorative models. To my mind, this Speedmaster Mark II re-issue is one of the most desirable ones. A final thought for those who prefer new watches over vintage ones, wanting the assurance of current technology, warranties and the like. 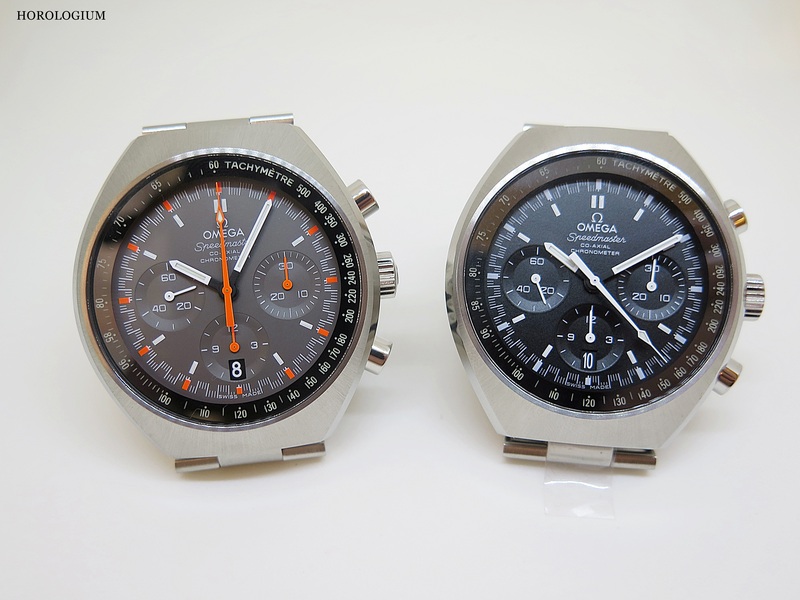 If you are looking for a modern/ retro Speedmaster to add to your collection, these are worth a look. love it… well done Omega. Now, where is my piggy bank? ?